Jeremy Nickel with his mother Beth Nickel. 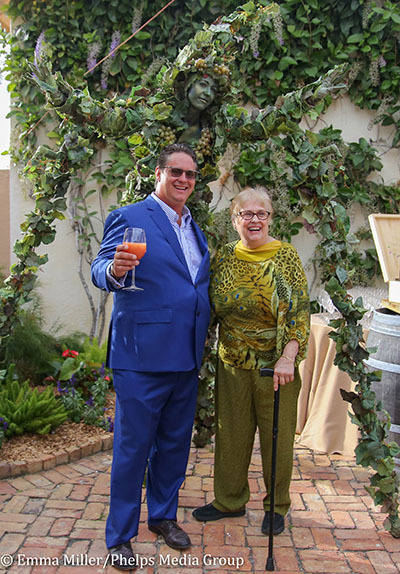 Second generation vintner Jeremy Nickel hosted friends and guests at his To-Kalon Farm in Wellington on Sunday, March 24. The Napa Valley Food & Wine Experience welcomed more than 300 guests to champagne served by knights on the red carpet, carriage rides around the property, living vine performers, a five-piece band, a jousting exhibition, cigar rollers and, of course, wines from the Vineyard House — a brand created paying tribute to Nickel’s late father, Gil Nickel. Guests dined on catering by Wellington Hospitality Group among beautiful décor by Gracie Street Interiors.